Bad habits…I can’t quit you!!! Let’s face it. We all have them, but don’t like to acknowledge their existence. Like that relentless little stain on a favorite shirt we insist on wearing, hoping no one will notice. Until in front of fifty people, a friend asks, “What’s that?” You look down – surprised, with that ‘hand in a cookie jar’ look. And as the neon spotlight of bad habit shame reigns down on you and your obvious spot, you say, “Oh Nooo! How did THAT get there?” Or is it just me?!?! How did my bad habits come about? Hopefully they can all be genealogically traced back to long ago ancestors in Ireland. I’ll simply say, “The redhead made me do it.” I can blame the whole blarney lot of them! Since I started this ‘bad habits anonymous’ group session – I’ll go first. I went straight to the recipient of my bad habit pain. Yep, I asked the husband. He was such a willing participant…hmmm. I limited his responses to my top five bad habits, so as not to take up too much of his day. He actually had the audacity to ask me if he could list restricting him to only five bad habits, as an added perk of a bad habit of mine. What gall! The following are in the order in which he so eagerly gave them. Sitting in bed reading and writing: First off, my book and blog doesn’t write itself. We wake up bright and early at six-thirty a.m. My husband fixes a cappuccino for me (in bed). A bad habit started after a traumatic life event. Can you say milk it? To make matters worse, we have an adjustable Tempur-Pedic bed that sits you up or elevates your legs at the push of a button. My people brain doesn’t wake up very easily in the morning. It needs time to sit alone, cappuccino in hand, without anything that talks back. However, my reading and writing brain wakes up like a five year old on Christmas day. Since reading is a symbiotic passion to writing. They play off each other like, well, two very energetic five year olds on Christmas morning. Starbucks in the afternoon: Okay, let’s be real. According to my bad habits I’m either reading, writing, philosophizing or cleaning on any given day. Can’t a girl catch a break! 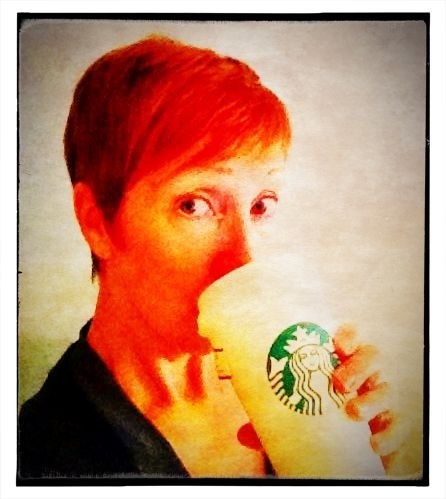 A Starbucks break – please and thank you. You remember my walking human calculator of a husband from the Orange Crush post, don’t you? Many moons ago I worked as his assistant at the bank. Rumor has it that I stopped for a cappuccino on my way into work (yes daily). As a result of looking at monotonous (utterly boring) loan files all day, I was in desperate need of fortification by way of a cappuccino, as it delivered the vital caffeine drip on my way home. Who cared for our children and cooked gourmet dinners after work by the way? Uh-huh. After months of my Starbucks routine, my very pragmatic (cheap) husband sat me down to illustrate (exaggerate) how much I was spending at the end of the month. It appears there was an occasional brownie added in for good measure on highly stressful days. What soothes a woman’s soul better than dark chocolate I ask? (Light bulb idea for future blogpost). He went on (blah blah blah) to tell me we should invest in a cappuccino machine and stop the Starbucks visits. Boo. So with reluctance, I conceded. That was years ago. Recent studies show that caffeine is good for the brain. And a little brain boost never hurt anyone. I no longer work with him. I’m a free bird. I can’t be stopped. And the adorable holiday cups are just around the corner. Not sending thank yous or cards: My poor husband has witnessed this senseless act for thirty-three years as he watched me enthusiastically buy card after card. Always asking as we leave the store, “Are you going to send this one?” I only wish I had an explanation. It makes no sense at all! I recently gave a dear friend her birthday gift. Barely a week after seeing her I received a lovely handwritten note. As I awwwed out loud at how beautiful and meaningful it was to me, I felt true shame as I realized I’d not sent the thank you card that I bought for her, from my lovely present…last February. I vowed, as I have before, to correct my bad habit once and for all. I love to write. So reason would have it that I would adore writing heartfelt or witty notes to friends and family. If ‘reason’ were present, my bad habits would be a thing of the past. I only wish I could relate this bad habit to a traumatic Hallmark store event from my childhood. I got nuthin. I’m sure there’s a support group with my name on it somewhere! If you’re ever in the Richmond area and in need of a card. I’m your girl. Not being able to skip house cleaning and organizing: A very good friend recently tagged me in a FB post. It was a photo of a beautiful, immaculate home and on it was written – Please excuse the mess. Her tag said, “Karen this has your name written all over it.”. She knows me all too well. Full disclosure. I clean once a week, thoroughly. But since building our Not So Empty Nest, refinishing furniture and writing my blog and book…I have skipped a week or so of cleaning. Scandalous! Something’s gotta give and lately it’s been our poor rental. As far as my need for organization. Well. My spices are arranged in alphabetical order because – duh, how else does one arrange spices? My clothes are hung according to color and season. Over the years, several friends have taken the pleasure of sneaking into my closet and mixing up the color code. No alarm sounded (possible great idea for new house). Proud parent alert: my daughter also arranges her clothes by color. Ahhh, I taught her well. An old friend, upon seeing my house for the first time years ago asked, “Have you always been this organized or is it because you have a child with disabilities and have to be?” A great perceptive question. I have always been a creature of habit though. I see organization purely as a form of time management and function. It releases me from the chains of chaos that clutter my mind. PSA – No clothes were harmed in the decoding of my closet. Having to explain something four different ways in one sitting: If you’ve read any of my blogs you know this to be a truth! I go deep. Jacques Cousteau deep. I can’t help myself. This is clearly and precisely my dad’s fault. Us Hannigans are a philosophical bunch. See, I can trace this back to my Irish ancestors! My father, being the intellectual that he was, taught us early on to walk and philosophize at the same time. I remember from a very young age asking a. very. simple. question and getting a “three faces of Eve” answer, as he examined it from all sides. However, he didn’t talk in a boring encyclopedia sort of way – anyone can look up facts. But rather in a more ‘down to earth, loaded with information on how it applies to life’ kind of way. Thank you dad (I think). My philosophical mind thinks of how said subject applies to me, to others. To the present and future. It ponders different aspects in relationship to me and others. It pivots said subject with the stealth and speed of a hummingbird on a sugar high (I love hummingbirds, don’t you?). Did you actually expect me to explain this simply? Bad habits, I have a few (many). I honestly wish I knew how to quit them. Maybe tomorrow I’ll jump out of bed at the crack of dawn, address all the cards to a bevy of shocked and surprised recipients in random order, while totally neglecting the house, as I sip a homemade cappuccino in silence. Eureka! This entry was posted in Humor, Life, Philosophy, Women and tagged Bad habits, cleaning, disabilities, Empty nest, Hallmark, humor, Ireland, organization, philosophy, reading, redheads, Richmond, Starbucks, Starting over, three faces of eve, writing. Bookmark the permalink. #1 – I can’t sit in bed and write – I’m to toey – I must be up and at em and then my muse hits me on the head and away I seem to go. #2 Dark chocolate – you said the magic words. #3 I have sent one or two thank you card in my life… I am a reader of cards – especially Hallmark. I ponder for what seems hours choosing the right words that are needing to be said (much to the disgust of Mr. S) who can choose one in 20 seconds. # 4 Perhaps a touch of OCD with the colour co-ordinating 🙂 (Both my girls have a touch of it too so said in kindness) mine is all over the shop. Thanks for your non- OCD comments. lol I had fun with this post. If we can’t poke fun at ourselves once in awhile – then what’s the point? Happy Monday! I hope when you wander to Fdk Co the next time , we can get together with those other redheads! !